For years, I have been addicted to potatoes. They’re my biggest weakness because they are so versitile. French fries, potato chips, mashed potatoes, hash browns, home fries, potato pancakes, Vichyssoise, potato soup, twice baked… the list goes on and on. You could have a different meal every single day and never repeat the same potato dish twice! I especially love potato chips. I have fond memories of visiting with my older neighbor, Ms. Rosengart, and she would always serve a generous bowl of potato chips. Unfortunately, potato chips aren’t the most healthy food. In recent months, I’ve been especially noticing the “made with genetically modified ingredients” note on nearly every potato chip label. So, for the last 6 months, I’ve been avoiding them. Imagine my surprise when I picked up a bag of New York Chips. Now, I fully recognize that no chip is exactly healthy, but wow, these are pretty darn good. Potatoes for New York Chips are grown (almost literally) in my backyard, next door to Letchworth State Park. They’re NOT made from genentically modified potatoes, and they are fried in avocado oil! What’s more important, they taste GREAT. It’s pretty amazing that in this day of big-Agra and giant international food conglomerates like Mondelez, Unilever, and Nestlé, that a tiny, family-owned farm can compete, but also produce a truly superior product. I bought a case of New York Chips from my locally owned supermarket (Brass’ ShurFine) this past week and I’ve been handing them out to family, colleagues, and friends. I stopped by my neighbourhood grocery (Criss’ Market) to pick up another bag today and convinced a fellow shopper to give them a try. I’m becoming a potato chip evangelist! 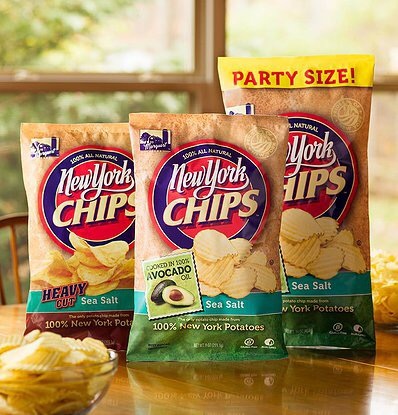 So, next time you head to the supermarket, give New York Chips a try, or order yours directly from the Marquart family via the New York Chips website. You won’t be disappointed… in fact, here’s an offer to the next ten readers: if you try New York Chips and don’t love them, I’ll buy you a bag of your favourite chips!